Carl’s shooting SOLID — again — this year with his 6mm HAGAR. He’s second, by ONE POINT, after 180 shots, but he’s down 20 Xs. 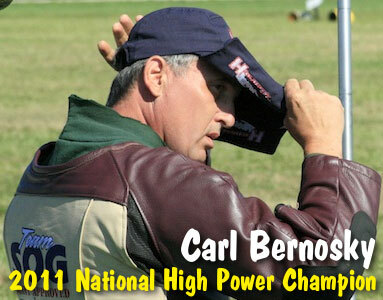 Carl has won the High Power Championship 9 times so far, most recently in 2008 — the first victory with an AR15-platform rifle. Either way, Way to Go Carl! Titles in 5 decades, youngest shooter to win the nationals, and possibly the most senior to win it all. EDITOR: Carl won the Match Rifle Category in 1981, but a Service Rifle shooter had a higher Agg. Some folks count that as a National Championship, while others do not. Notably, in 2010 when we interviewed Carl, he said the total (as of 2010) was eight HP titles, so he is not counting 1981. The win this year in 2011 would be Carl’s Ninth championship where he had the highest Agg among all shooters. While Carl gets a lot of “press” for his shooting accomplishments, there’s another aspect of Carl that does not get as much attention but is worthy of note. Carl also happens to be a very excellent at rifle stocks and building up great shooting rifles. See http://www.CarlBernosky.com for his business Carl Bernosky Shooting Sports, Inc. If you wonder whether he integrates all his shooting experience into in his work as well – he does, and his customers benefit from that! The work he did for me was excellent! 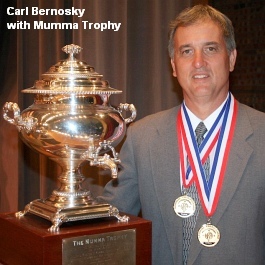 I’m pretty certain that Bernosky has now won 9 National Highpower Rifle Championships…not 10. I’m guessing you counted his 1981 match where he won the Match Rifle Championship, but did not win the overall championship as he was outshot by DI Boyd who was shooting a Service Rifle. Also this years 2393 was the THIRD highest score ever fired behind Gallagher’s 2010 record setting score and his own 2010 score of 2395 that was good for second that year. A little noted aspect of this years championship is Rodrigo Rosa’s 2390 which is the 4th highest score at Perry ever…in his first time firing at the Nationals. EDITOR: OK, Chris, we’re convinced. We started off the article listing 9 titles, then folks said we were wrong — that this would be carl’s Tenth. Going back to NRA records, we do see that D.I. Boyd, USMC was credited with winning the Service Rifle Championship in 1981 and he had the highest score, so technically, Carl was merely the match rifle champion that year. So… back it goes to nine titles… with an asterisk. Thank you for the correction. I don’t know who would be the folks “who do not” count DI Boyd as the winner of the Nationals in 1981….certainly not highpower competitors…and definitely not Carl. There is no ambiguity as to who the 1981 Champion would was. It was DI Boyd. This in no way diminishes Carl’s accomplishment this year nor over the last 5 decades! well we know what he did, and how many times he did it, but I would like to get a review of the gun, caliber, and components he did this with. EDITOR: Message received. We have scheduled an interview with Carl at SHOT Show and we’ll make sure to get answers to your questions! I ended up back at this old posting, so I thought I’d answer the question about equipment (4 years late!). Carl shot an AR15 built by John Holliger of White Oak Armament. The caliber was 6mm HAGAR. He shot Hornady bullets at least on some if not all the yard lines. If anyone still thinks there should be an asterisk regarding the 1981 National Highpower Championship…realize that the big trophy that everyone is gunning for for the overall title is the Mumma Trophy. The name engraved for 1981 is “D.I. Boyd”. The Wright Trophy is awarded to the Match Rifle Winner, and the DuPont Trophy to the Service Rifle Winner. I still think that Carl is the greatest Highpower Shooter in the history of the sport.